Joshua tree is one of the most characteristic plants of the Mojave Desert and extends southward to the Mojave-Sonoran Desert ecotone. This species grows from southern California, Mexico, and western Arizona eastward into southern Nevada and southwestern Utah.Var. brevifolia reaches its greatest abundance in the vicinity of Joshua Tree National Park; California. var. 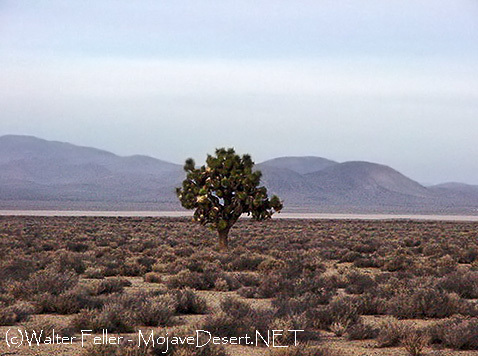 jaegeriana grows primarily in the eastern portion of the Mojave; var. herbertii is restricted to parts of the western Mojave Desert in California.The Joshua tree was named after the biblical leader, Joshua, as it reminded the Mormon pioneers of the hero raising out-stretched arms toward the heavens.William Lewis Manly referred to them as “cabbage trees” in his book (Death Valley in ’49), about the rescue of the Bennett and Arcane families from Death Valley.Pedro Fages, in his expedition along the edge of the Mojave searching for deserters from the Spanish Army, called the ungainly trees “palm” trees.